Haha so for my next several meals you will see lots and lots of… Thai food. I ordered out from Bo Thai (isn't this the cutest name), but the minimum for delivery is $15, so I ended up ordering THREE entrees, all for myself. So um… yeah there will be lots of Thai food to eat. But the good news is that I love the dishes and I never seem to get sick of Thai food, seriously. Whenever I talk about ordering out, it's probably the first cuisine that comes to mind. Maybe because it's always refreshing to eat, and doesn't get sickeningly greasy and meaty like Chinese or Italian takeout. 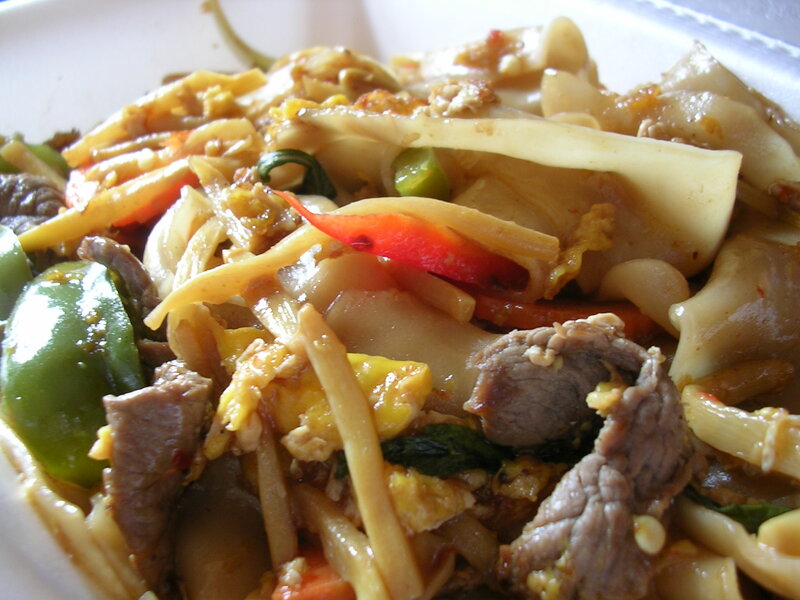 6:30PM Dorm Room – More Thai Food! 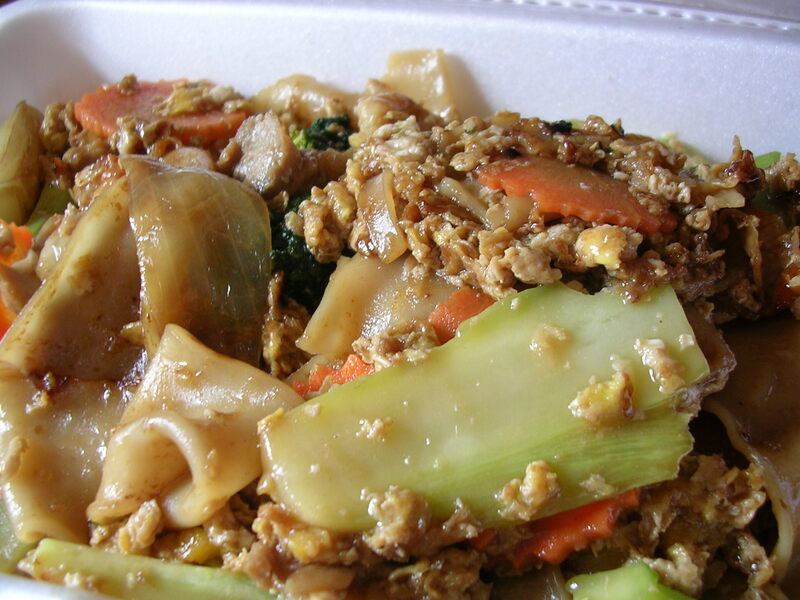 1/3 entree of pad thai with chicken (1.3 cup, 250 calories). Mmmm I love pad thai. The flavoring from the tamarind and the fish sauce really brings out this sweet and sour flavor in it that I haven't had in any other types of dishes. Oh and I adore bean sprouts, of which there are many in this dish :D The pad thai from Bo Thai isn't greasy at all, which is great too. The only complaint that I have about it is that the chicken could use a little more flavoring, and could be more tender too. I realize it's just chicken breast, and that the noodles take center stage here, but I like my protein to be savory too. 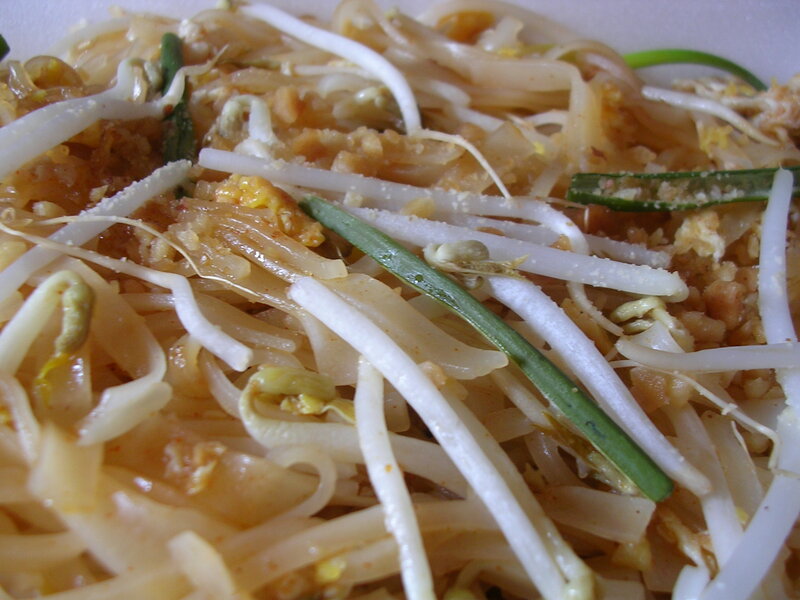 But oh, a yummy pad thai topped with crushed peanuts makes my day anyday. 1/2 of a ruby red grapefruit with a little sprinkling of sugar on top (50 calories). Just 1.5 more grapefruits to go haha. Not sure what else I should eat tonight though. I am still quite a bit short on calories, because my estimates come out to just shy of 1000 so far. I don't know what to do! I definitely have the appetite to eat more stuff, but I'm not particularly hungry. I don't know if I just estimated my numbers to be too small, or if I actually haven't consumed enough today. I worry that if I purposely eat another 200 calories worth of food I might be sabotaging myself if my calculations weren't quite right, but I also worry that I'm sabotaging myself anyway by eating too little (and thus slowing down my metabolism too quickly). I sure wish I had an accurate gauge as to how much I was eating every day. 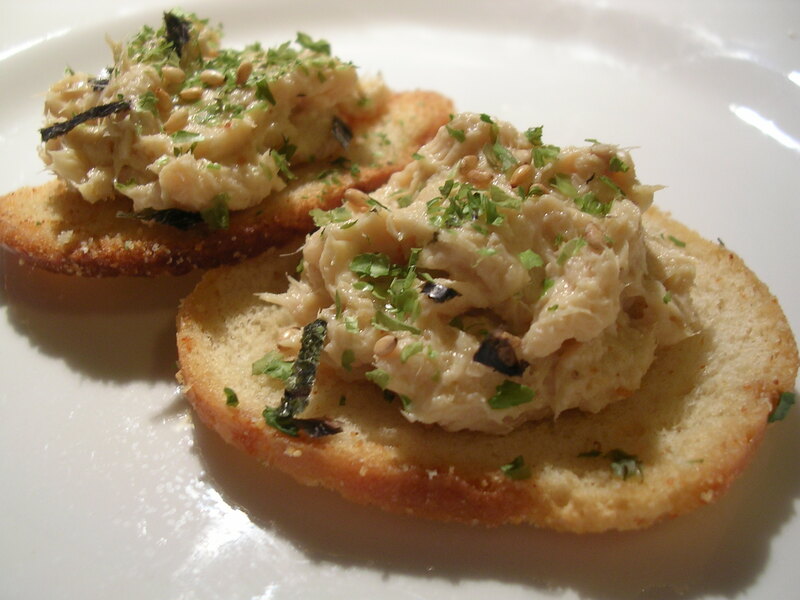 Mix well and spread on roasted garlic flavored bagel crisps. Top with Japanese rice seasoning (nori fumi furikake – consisting of sesame seeds, salt, sugar, and dried seaweed). Makes 3 servings of what I ate, listed above. I found that the mustard and parmesan cheese gave the salmon salad a distinct flavor from your everyday tuna salad. It was richer from the parmesan, and bolder from the mustard. I really enjoyed it on the bagel chips, especially along with the rice seasoning. The original purpose of that was to give it a little garnish and some texture variation, but the flavor of the seaweed and the extra salt & sugar really fit well with the seafood theme of the salad. Though now that I think of it… does anyone ever make salmon salad??? I've never heard of it before. Anyway, today totals happily to about 1150. Yum! This entry was posted on Friday, March 30th, 2007 at 11:20 pm	and posted in appetizers, beef, beverages, fruit and nuts, recipes, snacks, Thai, Uncategorized. You can follow any responses to this entry through the RSS 2.0 feed.